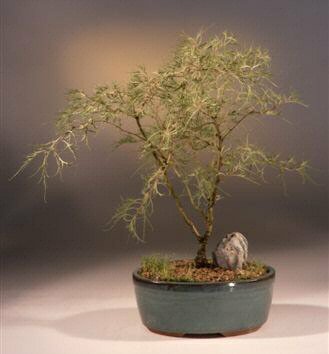 This dwarf only grows to 3-4 feet tall, and is highly sought after for bonsai. This delicate tree has fine textured thread-leafed light green foliage that looks like a weeping laceleaf maple. The peeling bark trunk has pendulous catkins. There is a distinctive white bark which is colored by a pigment called, appropriately enough, betulin. Much loved for bonsai because of their elegant beauty. 11 years old, 16" - 18" tall.